AFC Fylde returned to winning ways in the National League with a 3-0 win over Aldershot Town at Mill Farm. Goals from Ryan Croasdale, Serhat Tasdemir and Joe Cardle saw off the Shots but it could have been more. Coasters boss Dave Challinor made two changes to the side that drew at Eastleigh last week. Zaine Francis Angol returned from international duty, replacing Arlen Birch, and Serhat Tasdemir made his first start of the season, coming in for Ashley Hemmings. Fylde came out of the blocks well and tested Aldershot keeper George Legg after just six minutes. Good link-up play between Cardle and Danny Philliskirk created space for Tasdemir but his effort from 12 yards was pushed wide. Just two minutes later, the Coasters went even closer. Danny Rowe and Francis-Angol linked up well and the latter crossed for Tasdemir, whose header at the back post was somehow cleared off the line by George Fowler. 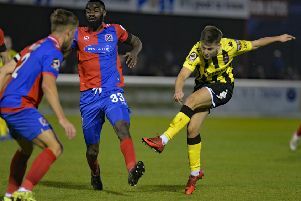 Francis-Angol was causing Aldershot all sorts of problems down the left and he did superbly well to burst through two defenders and put in a teasing cross, which was just beyond Tasdemir. Aldershot responded and had their first chance of the game as Jacob Berkeley-Agyepong was found in space by Dan Holman but fired just wide. Fylde went close again on 41 minutes when a Cardle corner was headed across goal by Neill Byrne into the path of Rowe, who turned and saw his shot headed off the line. Two minutes later, terrific work from Luke Burke saw him win back possession and find Tasdemir, who crossed to the back post for Rowe. The cross was headed away but only as far as Croasdale, who hammered the ball home from 12 yards. The Coasters were not finished for the half yet as superb work yet again between Cardle and Francis-Angol saw the summer signing from Dunfermline cross for Tasdemir to head home from close range. Challinor made his first change at the break as Andy Bond came on for Burke. Five minutes into the second half and Rowe was next to go close. After a one-two with Jim Kellermann, Croasdale found Rowe on the edge of the box, who executed a trademark turn before firing just wide. Just after the hour mark the Coasters made the game safe as good close control from Rowe allowed him to beat four Aldershot players to the ball and cross for Cardle to sweep the ball home. Two changes followed as Tasdemir and then Cardle were replaced by James Hardy and Gime Toure. Fylde should have made it four with 12 minutes to go as Bond’s cross from the right was somehow put narrowly wide of the far post by Rowe. Rowe had another chance in the last few minutes but his powerful effort was tipped over by Legg. The Reading loanee was certainly earning his money as he produced another excellent stop just a minute later to deny a 20-yard curling effort from Francis-Angol. The final whistle blew to confirm an impressive victory for the Coasters which moves them up to fifth place in the National League table. The Coasters’ next game sees them travel to North London to face Barnet at The Hive next Saturday. AFC Fylde: Lynch, Burke (Bond 46), Byrne, Tunnicliffe, Francis-Angol, Croasdale, Kellermann, Philliskirk, Tasdemir (Hardy 66), Rowe, Cardle (Toure 70). Subs not used: Brewitt, Hemmings. Aldershot Town: Legg, Kinsella, McDonnell, Fowler, Howell (McClure 58), Rowe, Lelan (Bernard 73), Gallagher (C), Holman, Agyepong (Wanadio 79), Smith. Subs not used: Cole, Booty.